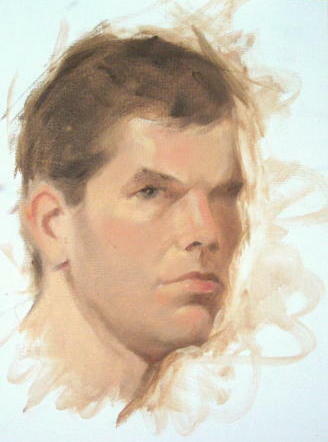 Below are some life painting studies I did in oils. I've included work-in-progress shots and a description of my materials and process. Enjoy! Fredrix Medium Texture Artists Canvas Pad 12x16"
Next I painted the darkest darks, the hair, with raw and burnt umber, and the lightest lights (the left side of the forehead and the upper cheek) with lots of white and a bit of cadmium yellow and red. This established the outside limits of a value range for me to work within. I think so. See how the reds along his forehead and nose pop out? 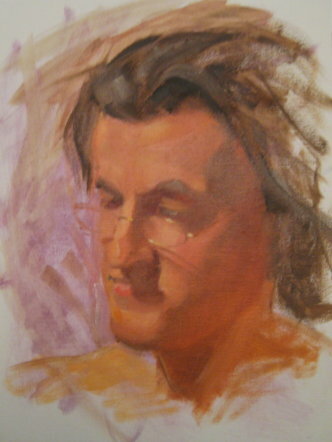 I kept the grey in the bottom half of his face and exaggerated it more to create the five o'clock shadow look. Next I added in the ear and fixed up the chin and nose. 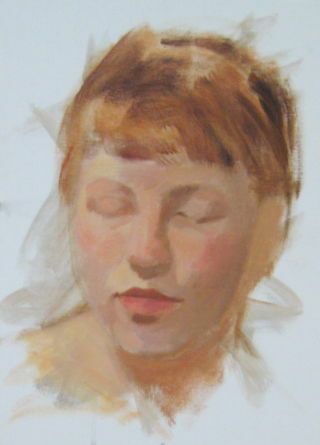 The eye in shadow is really hard for me to see when I'm painting from life. I walked up to Ben a few times to get a closer look, also checking the fold around his nostrils and his upper lip. This is what I came up with. I dabbed cerulean blue with white in a few places to add subtle, cool highlights in the shadow areas (see under his left eye, and on either side of the chin). I also placed some of this blue mix on the side of his face closer to the light, to build further contrast with the reds and yellows (e.g. under his right eye). So you can see several things going on at this early stage of the painting. Shapes and placement of features are blocked in, as well as the lights, mid-tones and darks. Lights are created with lots of white, some cad yellow and a touch of cad red. Mid-tones are white, yellow ochre, cad red and a dab of cerulean blue. 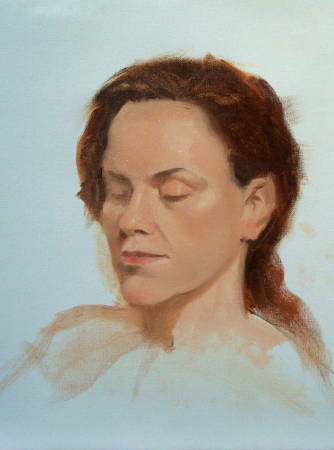 Shadows, mostly a mix of burnt umber and white with a bit of raw umber. 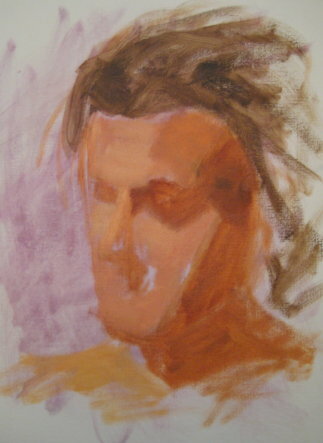 The hair is alizeron crimson for the dyed portion and raw umber for the natural dark. I always try to have a splash of red on the chin, nose, cheeks and tops of the ears, whether the color's there or not in reality. A mix of cad red, white and cad yellow, with a drop of alizeron, makes for a decent blush. 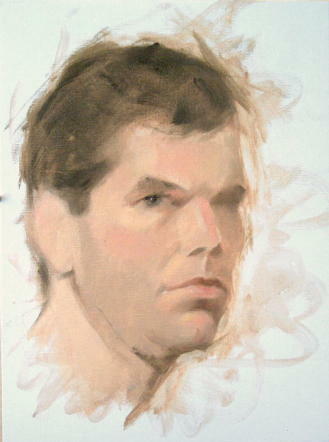 At this point, too, I changed the contour along the right side of the face. See how the variation between soft and hard edges can give the sense of a facial feature either receding or coming forward? 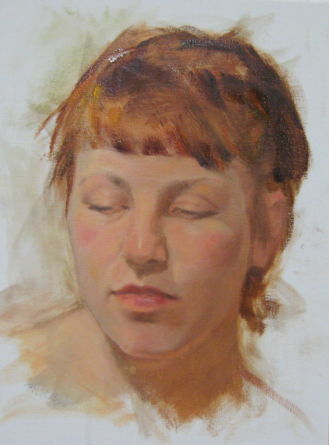 Good edge work can help establish volume (a perception of three dimensions) and interest in your painting. Here, I've modified the painted nose to more closely resemble the model's, and worked to shape detail in the left eye. One thing I'm trying to get away from in my sketches and figure studies are hard vertical lines. They make a painting look very stiff. 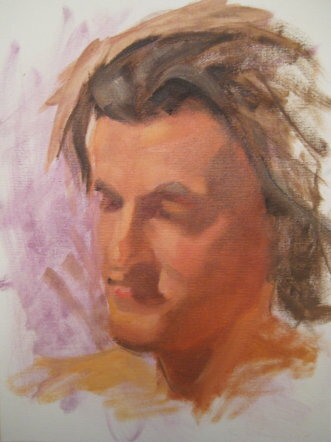 So I went back in at the end here, adding diagonal brush strokes to the hair and softening the lines of the neck. 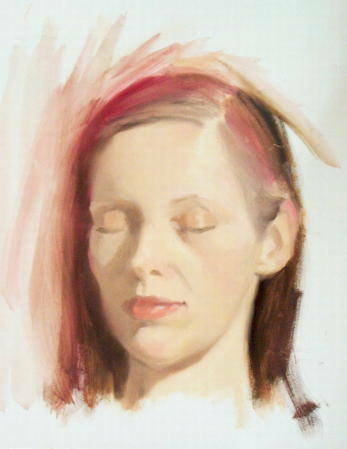 The model has a beautiful peaches-and-cream complexion that I tried to capture with a mix of white, cad yellow, cad orange and red for the rosey midtones. For the receding planes not in shadow, I used a grayish mixture of ultramarine blue, alizeron crimson and lots of white. 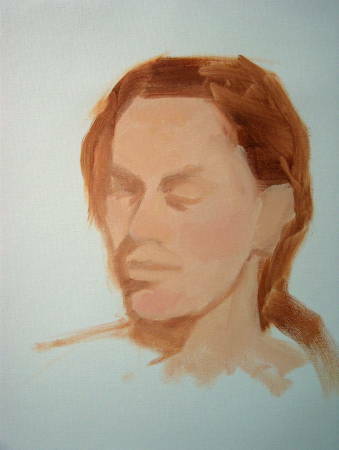 The shadow is mostly burnt umber, burnt sienna and white. I always use burnt sienna for red hair (with a bit of burnt umber in the dark parts); it works beautifully as long as you don't mix white into it, which totally mutes the intensity. More refining of features, especially around the eyes. Still staying clear of defining edges along the face until I get the basic shapes in place. Once I had the shapes and colors in, it was pretty easy to finish off details such as adding the ear and styling the hair. 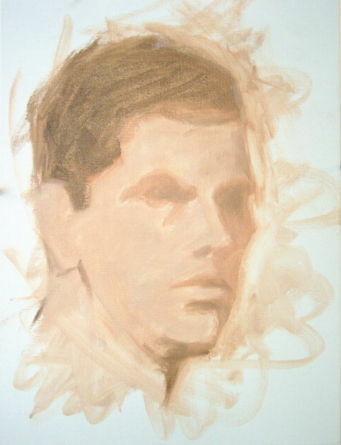 The edge along the right side of the face I made bluish; I put in some orange, burnt sienna and white along the shadow side of the face and under the chin to indicate reflected light. 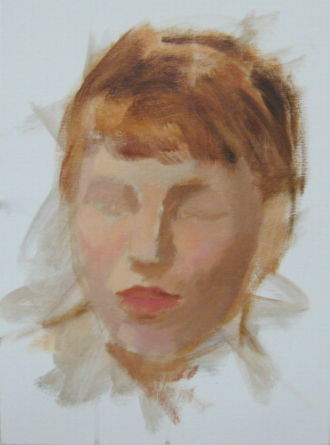 I prefer painting women. Apparently many artists do. When there's a choice at figure painting, the masses flock to the female model. It's arguable a woman's body is more aesthetically pleasing than a man's (sorry, guys). But I also find I can do smoother blending when painting a female, which lets me use my dangerously addictive fan brush. 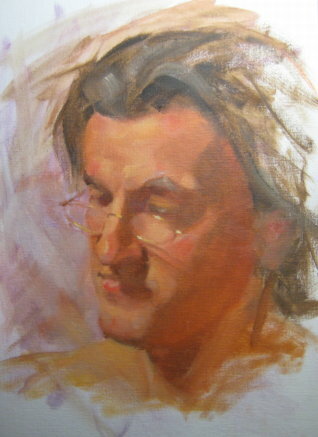 Still, too much blending = muted colours, boring brushwork, poor shaping! 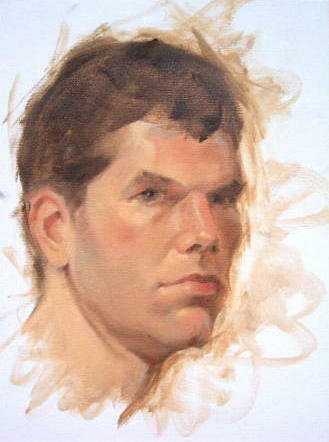 So, it's fun to paint a man and play with the sharp angles of the face. Delineation between dark and light shapes is easy to capture. With a bit of tweaking to the shadow shapes and some red and orange strokes added into the light, you can get a good likeness fast. A smattering of cool blues helps with the final sculpting of form and the color play. I've selectively sharpened edges around the nose (closer to the viewer), and blurred others, such as the edge of the forehead. Voila, a finished sketch and I barely touched my beloved fan brush!